Bonanza Slot -▶️ Spin for 117,649 possible ways to win! It’s time to go mining for valuable gems and big wins in Bonanza Slot from Big Time Gaming. This 6-reel slot, with 117,649 possible winning combinations, boasts some unique features that make it interesting and exciting. 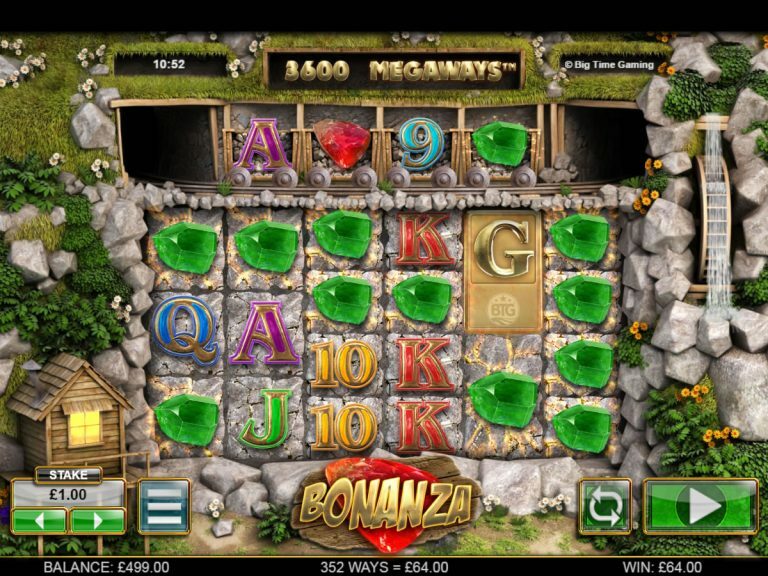 Bonanza utilizes the Big Time Gaming’s Megaways gaming engine, which allows for up to seven symbols per reel. Bonanza is jam packed with features, free spins and more. So, let’s dive right into the review and reveal all that Bonanza slot has to offer. When Bonanza launches, you will grasp the theme immediately, with the gem mine cut into the side of the mountain, the railway carts up top, water wheel to the right and the miners’ cottage. The look and feel of Bonanza is very good, a little quirky, but clean, crisp and inviting. The soundtrack, whilst fitting to the style of the game, can become a little annoying as every time the reels spins, Country Western banjo music plays and then fades out. After a few minutes, you’ll probably end up muting the sound. The reels have a combination of small and big symbols and wins are awarded for matching adjacent symbols, both left to right and right to left. As each spin takes place, and the reels start coming to a stop, the number of possible combinations for that spin is shown at the top of the screen. Above the main playing symbols, specifically above reels 2,3,4,5, are mining carts that also have playing symbols on them, which adds even more opportunities for winning combinations. The basic gameplay is rather straight forward; simply select your stake amount, ranging from 0.20 up to 20.00 per spin and hit the play button. There is also an auto-play option if you want to put the game on autopilot. Bonanza employs a feature that Big Time Gaming calls “reacting wins”, whereby after every winning combination, the symbols that made the combination disappear and the symbols above fall down into the open spaces to potentially form new winning combinations. Bonanza has 10 regular symbols. There are 5 lower paying symbols being 9, 10, J, Q, K, A. The higher paying symbols are represented by the gems, with the top paying gem being what appears to be around, purple diamond. The special symbols include the dynamite, which acts as a wild and can substitute for all symbols excluding the scatters. The scatter symbols are golden letters that make up the word GOLD and are the key to triggering the free spins feature. There is also a special free spin scatter of stacked gold bars that will appear only in the carts at the top during the free spins feature. Bonanza does not offer a dedicated bonus feature, but uses, as mentioned the “reacting wins” after each winning combination, to provide even more entertainment and winnings. Within the free spins rounds, every time a Free Spins scatter appears in the carts, you get awarded even more free spins. Three scatters give 5 extra spins and four scatters awards 10 extra spins. As you can imagine, the free spins feature, combined with the multiplier effect is where the money-making magic takes place. Bonanza has no dedicated jackpot and is not linked to any progressive jackpot. Bonanza certainly is not short of paylines and as we said, there are 117,649 possible winning combinations and a single stake amount that can be adjusted per spin. Bonanza has an RTP of 96% and this is fairly standard for a slot of this type. Bonanza has a high volatility, so it will take a fair amount of spins to get the winnings rolling, but once you initiate the free spins, then the bankroll boosting action begins. Overall, Bonanza is a great slot that can be enjoyed on desktop and mobile. It takes a few minutes to grasp the unique layout and features, but once you do, gameplay is smooth and enjoyable. With 117,000+ winning combinations you’d expect a win on every spin, but no slot ever offers that. Once you hit the free spins feature, that’s when the excitement and big wins really come into play.